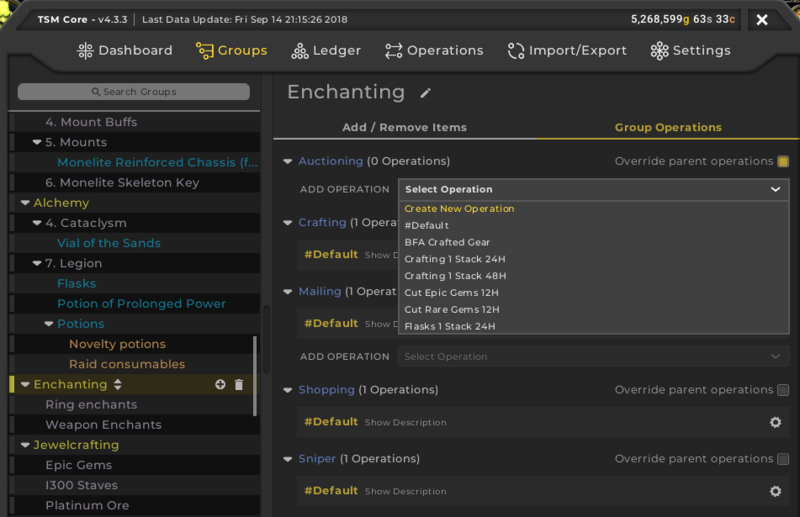 In this post we will be focusing on the second main component of TSM: Operations. In this post we will look at the basics of shopping and auctioning operations. As I mentioned in Part 2, Operations are rules bout how you want to treat your groups. TSM includes several modules where you can make operations to easily generate the actions you want. 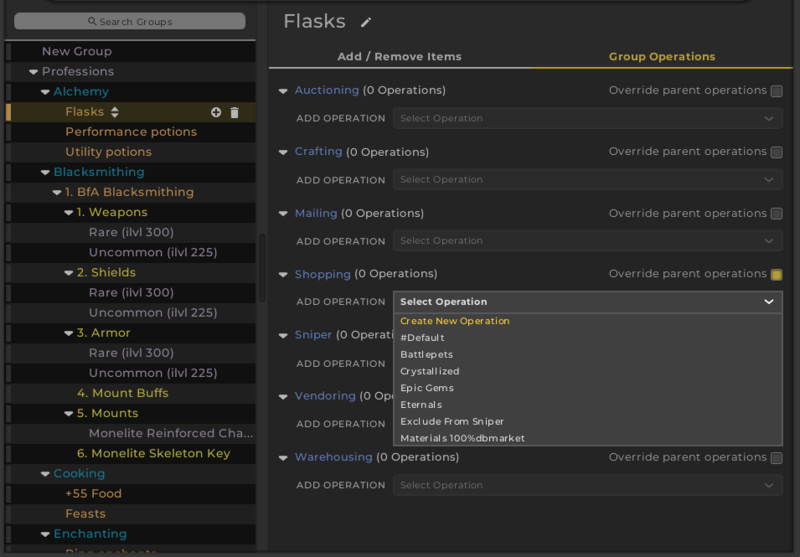 The idea behind operations is to make a rule for how you want to treat the items in the group. Then you can simply click the relevant action button in TSM and it will quickly perform the actions you have pre-defined. In this post we will only look at the core auctioning and shopping operations. Shopping operations are used to perform scans of the auction house for an item or a group of items. You can run shopping scans for several groups at the time where TSM will scan all the groups and show the pricing data relative to what you have defined in your operation. You can only apply one shopping operation to a group, as you would typically not have a use for multiple levels of shopping prices. There are two ways you can make a new operation. You can go to the operations pane on the TSM main window and click the add button next to the operation type. 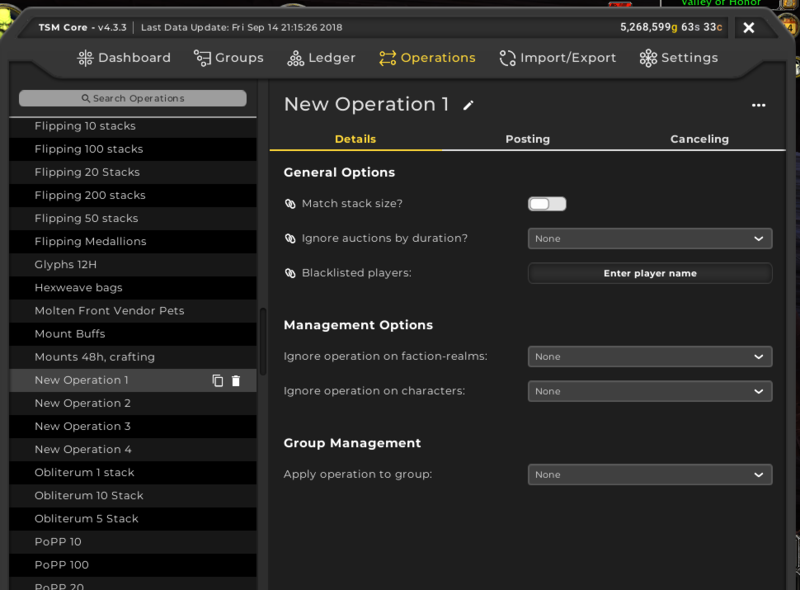 The other option is to go to a group and the group operations pane. You can then click the drop down menu and select “create a new operation” as shown below. In both cases you will be taken to the operation options. The second method has an advantage in that it automatically applies the operation to the group you made the operation for, which saves you a bit of time. The options you can set in a shopping operation are shown in the screenshot below. The most important one to define is the maximum price. This is typically the highest price you will want to buy an item at. If you set this correctly you can often just mindlessly buy anything below the maximum price when your scan has finished, which saves you a lot of time. Show auctions above max price, which chooses if you want to show the auctions above your maximum price in the results pane, and the neat stacks only checkbox that eliminates stuff like stacks of 1. You can also rename your operation by clicking the pen next to the name at the top, just as you do for groups. If you are buying materials for crafting I would generally use a max price of 100% Dbmarket. This is also the default material cost method and it will insure that your crafting costs are calculated correctly. For flipping markets you will prefer to use a lower percentage. As an example i typically use 80% dbmarket across all my material flipping operation. I would leave all the other settings at their default values. Auctioning operations are the most important operations in TSM. These are the rules you make to decide how your auctions are posted to the auction house. The only way we can make fold is to sell our items, and the only way we sell our items is through the auction house. Auctioning operations are more complex than shopping operations. You can also apply more than one auctioning operation as you may for instance want to post items in more than one stack size. 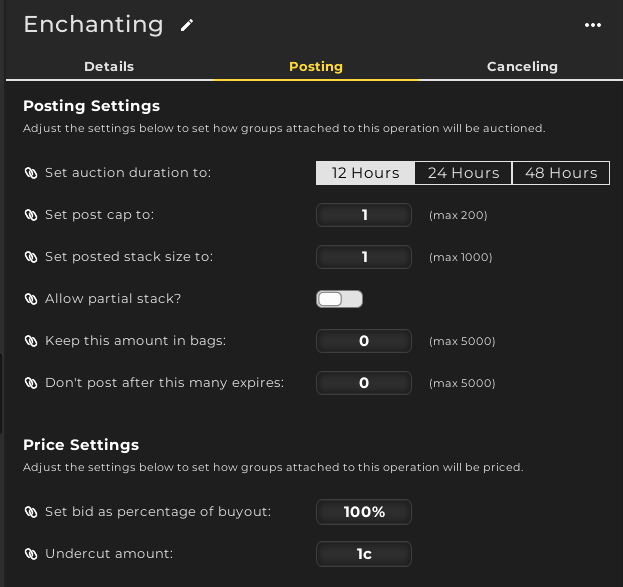 Auctioning operations will scan the auction house for the item in question and post the item from your bags according to the rules you define. It will include a minimum price, a normal price for when the AH is empty and a max price as well as rules for what happens if the price is below min or above max. In addition to this you can decide how much it will undercut the cheapest auction by how much lower you want the bid price to be compared to the buyout. You make an auctioning operation through the same two methods as for shopping operations. 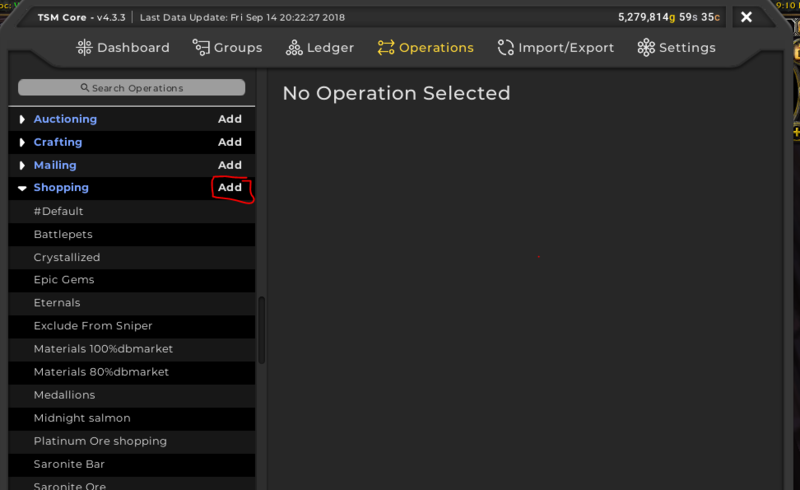 Either through the Add button on the operations page, or from the dropdown menu of a groups operations. When does it make sense to make more than one operation? Mostly when you are dealing with multiple stack sizes. This means it only makes sense for items players buy more than one of at a time. The prime example is of course material flipping, where my setup uses 5 different auctioning operations. Once you have created the operation you will be taken to the operation options. Auctioning operations have three pages of options. Luckily it’s only the Posting page that truly matters. The details menu looks like the screenshot below. It is similar to the shopping operation options, but it includes fewer options. The management and group management options generally do not matter much. The main option to consider here is the first one “Match stack size?”. If this is enabled TSM will only consider other auctions of the exact same stack size when choosing whether or not to undercut. 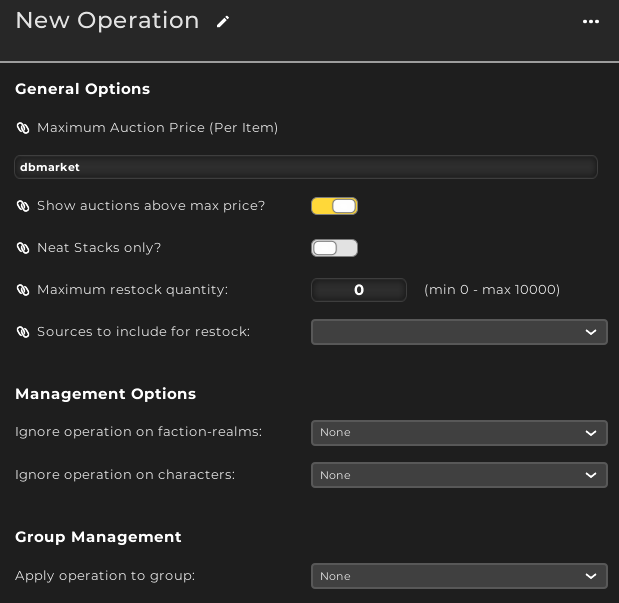 There are three main settings you need to set to get your operation working: Duration, Price and stack sizes. Duration is the first option you get to. Duration will depend on how likely you are to be undercut, and how often you have the time to repost. For most markets I think 24H or 48H is optimal. The downside to longer durations is of course that you pay a larger deposit fee which is lost if the item does not sell. 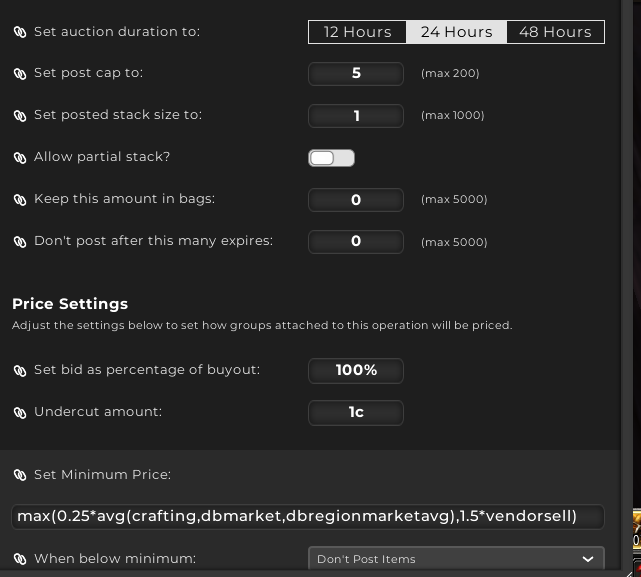 So if your item would always either sell or get undercut within 12 hours, you are better off with 12 hour auctions. Stack sizes and the number of auctions are another key factor. The stack size should be based on how many items a player needs at the time. For crafted gear it is obviously going to be stacks of 1. Whereas for the uncommon gem that is used for the current warfront turn-in you would want to go for a stack of 15, as the turn-in quest requires 15 of them. You also need to set the right number of auctions. For gear you should only really post one at the time, whereas for materials you would post several auctions as players may need a lot of materials at once. You set this through “Set Post Cap to” number which sets the maximum number of auctions of this type you post. There are three pricing settings you need to choose, minimum price, normal price and maximum price. The minimum price is by far the most important one. You need to ensure that the minimum price guarantees a decent profit margin. The normal and maximum prices will typically matter much less. You are unlikely to be the only one posting an item on the auction house, and the maximum price will very rarely be reached. You can define prices in two main ways. You can either just type your gold amounts directly. For instance if you want to post an item for 400 gold minimum and 1000 gold if you are the only one you would just type 400g in the minimum price field and 1000g in the normal price field. This is easy to understand and guarantees you know what’s happening. The issue is of course that you will have to change your settings if the prices change. TSM has another way you can set prices however. TSM has a ton of built in value functions. These will give you access to a variable that represents the market value, minimum price, crafting cost or the historical price of an item among other things. Using these generic variables means that your operations will evaluate each item compared to prices related to it. The advantage is that you can use the same operation for multiple items, as well as the fact that pricing data is continuously updated. We will dive deeper into price sources later. For our case study enchanting group we will only make an auctioning operation. First we will go to the enchanting base group and click Group Operations. We will Click the select operation and Choose Create New operation from the menu. Then we will name it enchanting. We will leave all the settings on the details pane as default and head to the Posting tab. First we need to decide the duration. Enchants are items that usually sell quickly, and with fairly high competition. This means that you want to re-post your auctions often. As such I find that a 12 hour duration is the best one. Your auction will either sell or get undercut way before that, often in the first hour. Enchants are typically bought one at the time. This means that we will just want to post one of each on the auction house. For pricing I will use the built in value source called crafting. This one is based on your crafting cost if you were to buy all the materials on the auction house. To guarantee that we make a profit I will set the minimum price to 120% crafting. This guarantees me a 20% profit margin above the cost of my materials. 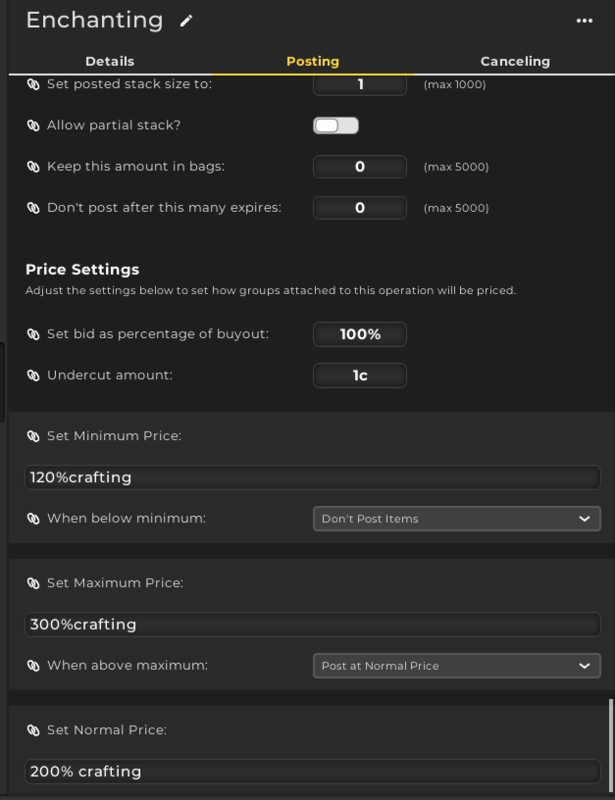 I will set the normal price to 200% crafting and the maximum price to 300% crafting. Normal and max prices will most likely never matter in this market as there is just way too much activity. We will leave all the other options at their defaults as there is no reason to play around with bid percentages or undercut amounts. Those options will be covered in a later installment. You should now feel comfortable with the basics of making your operations. Don’t feel bad if you don’t understand all the details yet, we will flesh this out gradually as all of the pieces of TSM will impact each other. Just wondering about the price syntax, should there be spaces there or no spaces between the % and crafting? It doesn’t matter. They’re both interpreted the same way. I tend to have problems with the crafting source. I’ll get an error stating that my price (“120% crafting”) is invalid. I know these are often caused by not having the correct profession data, but sometimes I’ll have the profession data and still get the error. An example of this is Disenchanting Rods, the crafted follower item for BFA enchanting. It can be sold on the AH, but TSM crafting doesn’t seem to have any crafting data for it. When I run a post scan, it just throws the crafting error. Do you have any tips for working around this, or debugging to find what exactly is causing the error? The disenchanting rod requires Expulsom and Hydrocores. These cant be trader on the AH and TSM doesnt have a valid source for them which makes the entire crafting cost invalid. You can change the material value of individual materials by going to /tsm crafting-> crafting reports-> materials. Then you seach up the items and change the string. I suggest usikg hard coded gold values for the tile being. Hey, not sure I understand exactly what you’re trying to do. Are you trying to make a custom price to represent the value of an item if you mill or disenchant it? the set min max and normal prices automatically reset to the default line of text instead of your 120%crafting does this matter ? You need to press enter every time you make a change. Hi, when I enter 120%crafting as per your guide, it fails to post back saying that it is invalid… any ideas? That happens when TSM can’t calculate the crafting source. This can happen if TSM hasn’t successfully scanned the recipe from your profession tab or if one of the materials required is missing a valid price (this usually only happens for BoP materials like Expulsom).